Does It Matter That NASA Still Doesn't Have a Permanent Leader? 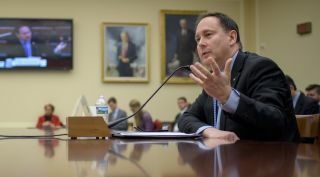 Robert Lightfoot, seen here testifying at a House Science Committee hearing on NASA's fisal year 2019 budget proposal in March 2018, has served as the space agency's acting administrator since January 2017. Lightfoot has announced that he will retire from NASA on April 30. NASA has been without a permanent administrator for almost 14 months, which is a record. "The current situation is clearly unacceptable, because a person who is acting — he or she has less legitimacy, less political influence," John Logsdon, professor emeritus of political science and international affairs at George Washington University, told Space.com. "Congress doesn't have to take them seriously," he added. "You can execute policy if the White House gives direction, but it's hard to take the initiative." The White House has given NASA direction recently, for what it's worth: In December, the Trump administration tasked the agency with sending astronauts back to the moon, as a precursor to crewed Mars missions. A quick history: NASA's last official administrator was former space shuttle commander Charles Bolden. He and his deputy left office on Jan. 20, 2017, the day that Donald Trump was sworn in as president . Lightfoot, then NASA's associate administrator, began acting in Bolden's place. The White House did not nominate a permanent successor — former Rep. Jim Bridenstine, R-Okla., — until Sept. 1, 2017. Meanwhile, NASA's No. 2 position also remains vacant. The agency's last deputy administrator, Lesa Roe (who was an acting rather than permanent deputy), left the position in September. Bridenstine is still awaiting confirmation. With Lightfoot leaving, no deputy administrator in place and Bridenstine not confirmed yet, Jurczyk is set to assume the leadership position. "The NASA administrator position has to be confirmed by the Senate. So that requires a Senate committee to first screen the candidate, and vote on whether they want that candidate to be heard by the entire Senate. And then the Senate needs to vote and approve the position," said Robert Pearlman, editor of the space history and memorabilia website collectSPACE, which is a Space.com partner. Bridenstine's office declined to speak with Space.com, saying that the former congressman is not doing interviews during the confirmation process. A representative from Lightfoot's office at NASA did not respond to interview requests before this article's deadline. But in remarks to the House Science Committee’s Subcommittee on Space on March 7, Lightfoot said that his access to policymakers hasn't been unduly restricted. “From my perspective, as the one sitting in that chair, it is always of value to have the person the president wants in this position,” said Lightfoot in his testimony, Spaceflight Now reported. "And I think that would be important for us all from that standpoint," he continued. "But I can tell you for the past year I've had no trouble having access to the people I need to have access to. I've been to both [National] Space Councils. I haven't had to sit in the back row. I've sat right at the table as the administrator would be. But there is value in having the approved presidential nominee in the chair." The longest-serving acting administrator before Lightfoot was George Low, who held that title from September 1970 to April 1971 — a span of 222 days, Pearlman said. Acting administrators have served in interesting times, however. Perhaps the most famous example was Thomas O. Paine, who was one of the players in authorizing the Apollo 8 moon-orbiting mission in December 1968. He became acting NASA administrator on Oct. 8, 1968, less than three months before Apollo 8's launch. At the time, NASA was in a race to get humans to the moon first, before the Soviet Union. NASA had a mandate to land a human on the moon before the end of 1969. (Spoiler alert: It succeeded.) Apollo 8 was originally supposed to be an Earth-orbiting mission, but it was sent on a moon-orbiting mission instead — in large part because it was feared the Soviet Union would also attempt a human moon-orbiting mission before the end of the year. Paine eventually became permanent administrator and served until 1970. At the time, an ad hoc committee called the Space Task Group (chaired by then U.S. Vice President Spiro Agnew) was looking at options after the Apollo moon program. Paine left after proposing an ambitious plan for NASA to explore space. Paine wanted a space station, a space transportation system and a mission to Mars, according to Roger Launius, who recently retired from his curatorial position at the Smithsonian National Air and Space Museum in Washington, D.C.
"The Nixon administration basically said 'No' to all of Paine's ideas, so Paine resigned in September of 1970," Launius told Space.com. Low became acting administrator in his place. While acting as administrator, Low's approach was more modest; in the NASA budget he submitted to the White House that September, he recommended building a space transportation system first. That was the first baby step toward the space shuttle program, which flew between 1981 and 2011. NASA has now been tasked with sending humans back to the moon, likely toward the end of the 2020s. As is typical of these discussions, critics worry that the agency is not allocating enough budgetary resources to accomplish this goal in this timeframe. The larger question, however, is whether an acting administrator could effectively shepherd this policy long enough for it to take hold. Having an acting administrator "is a problem in the sense that you don't have direction from somebody who's a representative of the president," Launius said. While the agency's operations continue, the acting administrator has the delicate job of reflecting the Trump administration's priorities while acting as a voice for NASA to the White House, he added. "That interchange of information is obviously taking place, but it's taking place at other levels," Launius said. Such interchanges are occurring between senior-level NASA officials, the Office of Science and Technology Policy at the White House, and the committees in Congress tasked with overseeing parts of NASA, he added. Logsdon pointed out that Lightfoot's resignation in April will come at an interesting moment. Typically, NASA administrators spend the summer working on the budget for the coming year. This means it likely will be Lightfoot's successor who will be working on policy for the 2019 NASA budget, Logsdon said.